More people are now taking to inflatable kayaks. 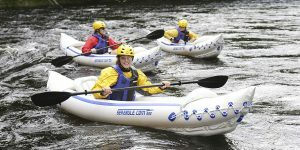 They tend to have more advantages when compared to the traditional hard shell kayaks. Nowadays, these kayaks can be used in other locations. This is thanks to the constant advancements in technology. This is how the best inflatable kayaks, have been able to hold their own. Much like other outdoor activities, kayaking enables you to take in nature. Whether you are a beginner or an outdoor enthusiast, you will definitely have fun with one of these. The kayak’s Weight Capacity: A kayak is built to handle a certain weight limit. Make sure you adhere to this and always check before you buy. Comfort: you need to be as comfortable as possible to be able to ride longer. Make sure it will have enough leg room for you, and that the seat is comfortable too. The Size and Weight of The Kayak: Since they are meant to be portable, this is a very important factor. Make sure that they can be folded down to the size you need and are light enough as well. Construction: Make sure the material used to make it is tough enough. This will also play a part in the kayak’s durability. They Are Portable: Compare to hard shell kayaks, they are very easy to carry around. They Don’t Need Much Storage Space: Since they can be deflated, you can even store them in a bag. They Are Affordable: You will be able to start out in the sport, without straining yourself financially. Its human nature to want to feel safe at all times. This applies to almost everything, regardless of the sport or activity we are taking on. Zray offers you an inflatable Kayak, which has been certified by the National Marine Manufacturers Association. This pathfinder kayak meets the standards set by the American Boat & Yacht Council. When compared to the US Coast Guard Requirements, these standards are much more comprehensive. It has dimensions of about 138″ x 32″ x 25″ and can handle up to 330lbs. 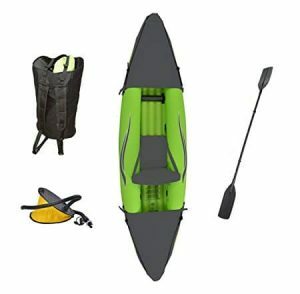 It is a heavyweight kayak, which is puncture resistant. You will be able to see how strong it is, once you acquire it. It’s quite frustrating when the inflation and deflation process takes too long. If you wish to avoid such, then this is the kayak for you. It was built with a pressure valve which is oversized. The valve and a double locking air-tight seal, make inflation and deflation a breeze. You will also get a strong 4-section 87-in long oar with aluminum tubes. The polypropylene blades are also enlarged and re-enforced. For added safety, the inflatable kayak has anti-leak welding. In total, it has about 3 air chambers. One is located in the beam inflatable floor, while the rest are located in the hull. As a result, the user will be more comfortable and the kayak will even last longer. When inflated, the Driftsun inflatable kayak measures about 10ft. x 35 x 16. It is able to comfortably fit 2 people and would make a perfect gift. When you buy it, you will also get a deluxe high flow double action hand pump. You won’t take more than 5 minutes before you can get on. The bottom of the kayak was made using Heavy-duty PVC Tarpaulin. Everything regarding its construction is of quality. The PVC used removes any chances of punctures taking place. No leaking will occur as well as Double Threaded Boston valves were used. The cover was made from tough 840D coated nylon oxford fabric. The fabric is resistant to ripping and tearing. If you are a fan of traditional kayaks, you will love this option. This is mainly because of the inflatable kayak’s stiffness and resilience. All this is brought about by the 3 air chambers. The air chambers are resistant to puncture since they have tripe layers of PVC. You will be amazed by how durable it actually is. 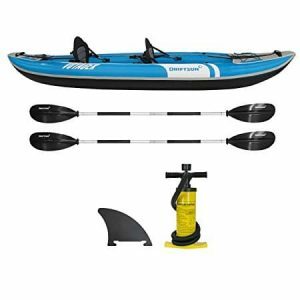 Your purchase will get you; an inflatable seat, (2) fins and an 87-inch lightweight rotatable paddle. When inflated the kayak measures about 9-feet 1-inch by 30.25-inches by 13.5-inches. Transporting it will also be effortless since it weighs 25lbs. 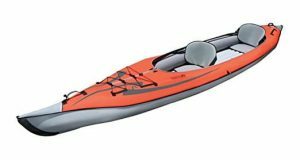 The kayak is backed by a 1-year limited Manufacturer’s warranty. It also comes with a manual in case you get stuck. 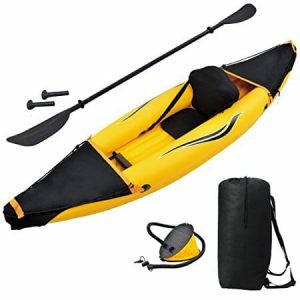 This is one of the most popular and versatile inflatable kayaks in the market. 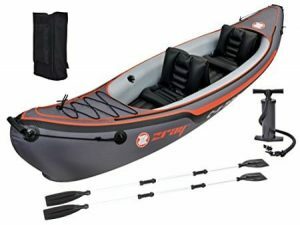 If you are looking for a two-person kayak, I would highly recommend this one. The kayak is able to hold up to 500lbs. it is the perfect sports kayak. Its weight capacity makes it possible for you to choose from a variety of potential partners. You will not be restricted like with other kayaks. The kayak seat it comes with is deluxe and can be moved. In case anything happens, you will be in good hands. Your purchase will include a repair kit, which will come in handy at the time. For better tracking, I would recommend this Advanced Elements kayak. This is because the bow and stern are defined by built-in aluminum ribs. You have the option of paddling solo or tandem. It has 3 seat locations, which make that possible. You could paddle for hours when using this kayak. This is because its seats are very comfortable and have great padding. Additionally, they offer excellent support and you can also adjust them freely. The kayak also has extreme puncture resistance. 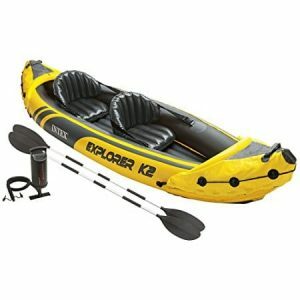 With this particular Sea Eagle inflatable kayak, your kayaking experience will never be the same again. It has certification from the NMMA and everything about it is on another level. Tracking and speeding will be far better. The kayak has a pair of skegs at the bottom, for that purpose. It also has a self-bailing drain valve and 3 deluxe one-way valves. The interior is roomy and it the seams have been high frequency welded. 10000 volts of power was used to fuse the material. This kayak is even rated at Class III whitewater. If you are a professional, you should probably take this inflatable kayak into consideration. It’s the ultimate purchase for pros. This kayak can hold up to 3 people and has a maximum weight capacity of 650lbs. All the 3 individuals can fit perfectly without any frustrations. It weighs about 32lbs and takes approximately 8 minutes to get fully inflated. It was made using material which is resistant to effects of the sun and saltwater. 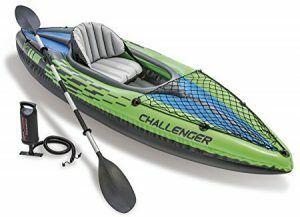 The kayak has two carry handles, 5-Deluxe One-Way Valves, and a Self-Bailing Drain Valve. Your purchase also gets you; 2 paddles, 2-Deluxe Inflatable Seats, a Foot Pump, a Carry Bag and Repair Kit. 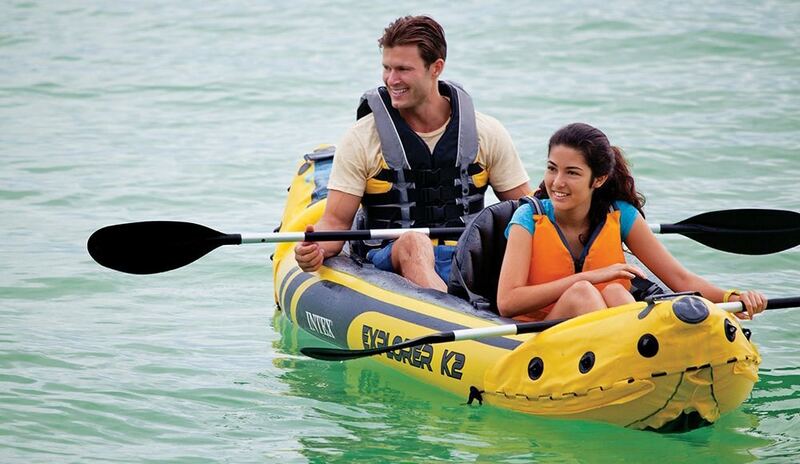 Intex prioritized user comfort, with this inflatable kayak. Most users can attest to this, from their personal experience. You will love how spacious the cockpit is. It is very comfortable as well. The kayak’s seat even comes with a backrest, to ensure you can use it for longer. To provide you with directional stability, the kayak’s skeg can be removed. If you often ride kayak in mild rivers and lakes, this would be the proper fit for you. It was made for small bodies of water and comes in a very bright color. The bright color is meant to make you more visible, in case of an emergency. If you love to stand out, then the kayak’s eye-catching graphics will impress you. The welded material used to make it is very durable. 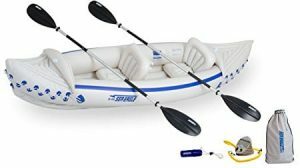 Much like their other inflatable kayak, it also has a roomy cockpit. All index kayaks are extremely comfortable and stable. This one even has inflatable I-beam floors for stability. Both ends of the kayak have grab lines, and it also comes with a cargo net. With the cargo net, you will not be troubled when you need to store extra gear. When choosing a kayak for personal use, you don’t always have to settle for a one person option. In sports and other outdoor activities, the more people participate the merrier. Even when you are a beginner, you will have more fun if you had someone with you. 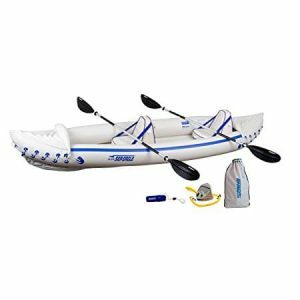 We believe that this Top 10 Best Inflatable Kayaks review, will make your buying process even easier.